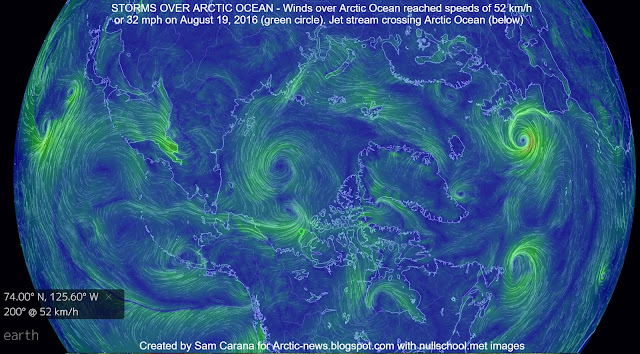 Winds over the Arctic Ocean reached speeds of up to 32 mph or 52 km/h on August 19, 2016. The image below shows the Jet Stream crossing Arctic Ocean on August 19, 2016 (see map on above image for geographic reference). 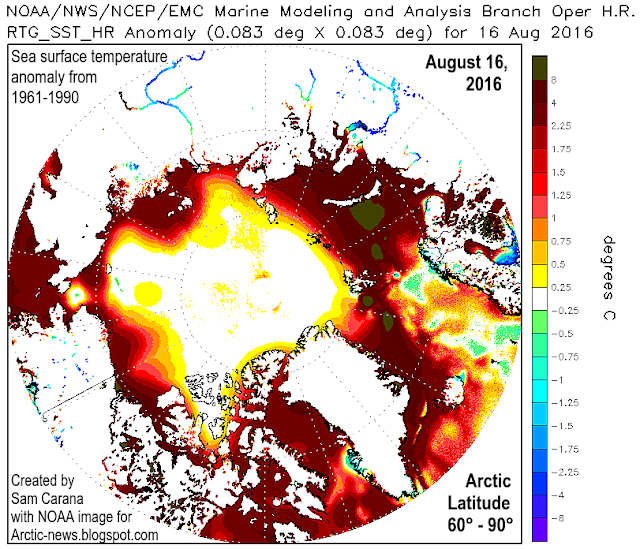 The Naval Research Lab image on the right shows a forecast for sea ice speed and drift run on August 15, 2016, and valid for August 17, 2016. 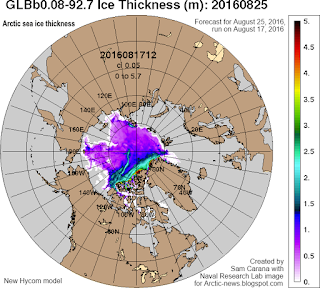 These storms come at a time when the sea ice has become extremely thin, as illustrated by the Naval Research Lab sea ice thickness animation below, covering a 30-day period run on August 17, 2016, with a forecast through to August 25, 2016. The animation shows that the multi-year sea ice has now virtually disappeared. With the sea ice in such a bad shape, strong winds can cause a rapid drop in sea ice extent, at a time when the Arctic still has quite a bit of insolation. At the North Pole, insolation will come down to zero at the time of the September 2016 Equinox. 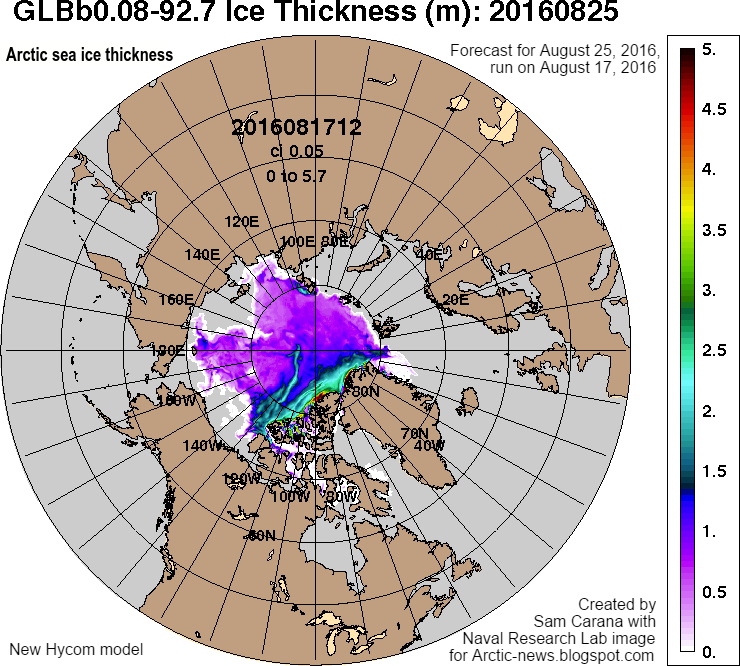 Even more terrifying is the Naval Research Lab's Arctic sea ice thickness forecast for August 25, 2016, run on August 17, 2016, using a new Hycom model, as shown on the right. With the thicker multi-year sea ice now virtually gone, the remaining sea ice is prone to fracture and to become slushy, which also makes it darker in color and thus prone to absorb more sunlight. Furthermore, if strong winds keep hitting the Arctic Ocean over the next few weeks, this could push much of the sea ice out of the Arctic Ocean, along the edges of Greenland and into the Atlantic Ocean. 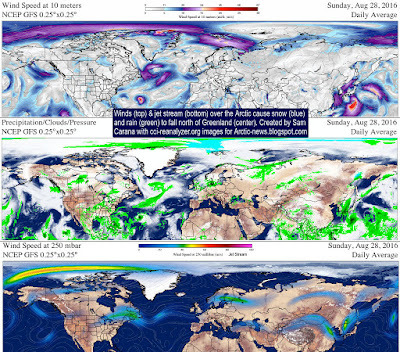 Strong winds are forecast to keep hitting the Arctic Ocean hard for the next week, as illustrated by the image on the right showing a forecast for August 24, 2016. As sea ice extent falls, less sunlight gets reflected back into space and is instead absorbed by the Arctic. 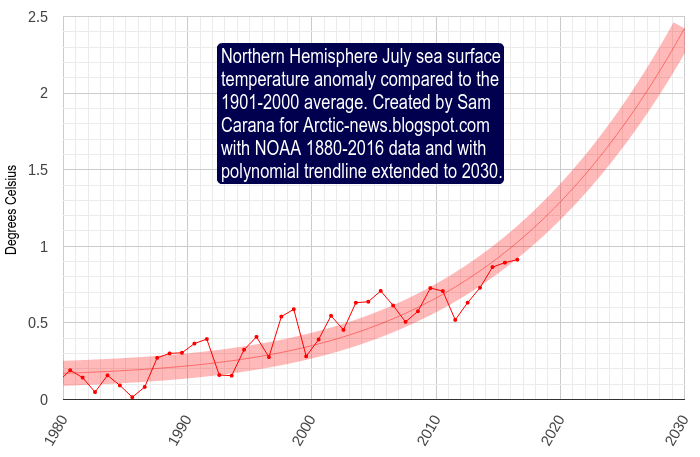 Once the sea ice is gone, this can contribute to a rapid rise in temperature of the surface waters. The video below shows cci-reanalyzer.org wind speed at 10 meters forecasts from August 25, 2016 1800 UTC to September 2, 2016 0300 UTC. 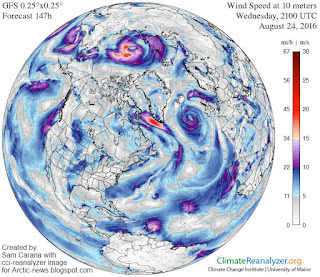 The left panel on the image below shows winds (surface) reaching speeds as high as 61 km/h or 38 mph over the Arctic Ocean (green circle), while the right panel shows winds at 250 hPa (jet stream). As the Arctic warms faster than the rest of the world, the temperature difference between the Equator and the Arctic decreases, slowing down the speed at which the Northern Polar Jet Stream circumnavigates Earth, and making it wavier. As a result, the Jet Stream can extend far over North America and Eurasia, enabling cold air to move more easily out of the Arctic (e.g. deep into Siberia) and at the same time enabling warm air to move more easily into the Arctic (e.g. from the Pacific Ocean). Such changes to the jet stream also enable strong winds to cross East Siberia more easily and cause stormy weather over the Arctic Ocean. This is illustrated by the image below. The left panel shows the jet stream crossing East Siberia at speeds as high as 277 km/h or 172 mph on August 27, 2016, while at surface level cyclonic winds occurring over the Arctic ocean reached speeds as high as 78 km/h or 48 mph that day. The right panel shows that, on that day, cold air moved deep into Central Siberia, resulting in temperatures as lows as -15.9°C or 3.5°F in Central Siberia and temperatures that were higher than they used to be over the Arctic Ocean. The image on the right shows surface winds (top) and winds at 250 hPa (i.e. 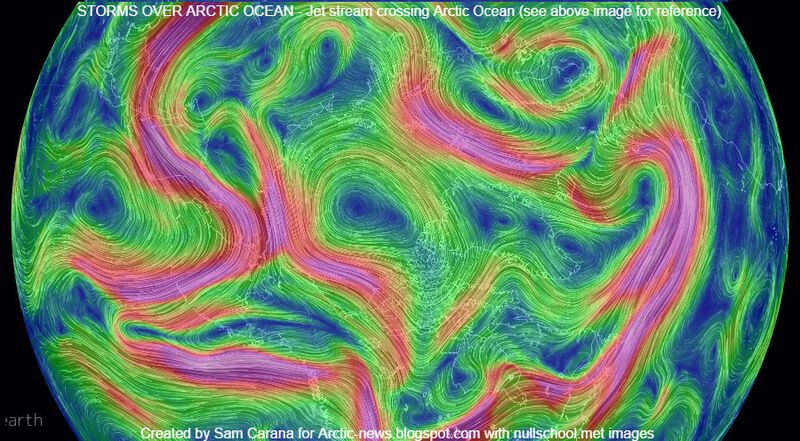 jet stream, bottom) over the Arctic Ocean causing snow (blue) and rain (green) to fall north of Greenland (center). Rain can have a devastating impact on the sea ice, due to kinetic energy breaking up the ice as it gets hit. This can fragment the ice, resulting in water that is warmer than the ice to melt it both at the top and at the sides, in addition to melting that occurs at the bottom due to ocean heat warming the ice from below and melting that occurs at the top due to sunlight warming the ice from above. Furthermore, where the rainwater stays on top of the sea ice, pools of water will form, fed by rainwater and meltwater. This will darken the surface. Melting sea ice is also darker in color and, where sea ice melts away altogether, even darker water will emerge. As a result, less sunlight is getting reflected back into space and more sunlight is instead absorbed. The image below shows Arctic sea ice thickness (in m, nowcast, run on August 27, 2016, valid for August 28, 2016, panel left) and Arctic sea ice speed and drift (in cm per second, nowcast, run on August 27, 2016, valid for August 28, 2016, panel right). 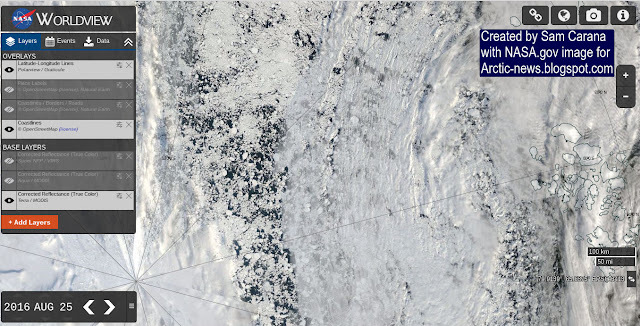 The danger is that such storms, especially at this time of year, can push much sea ice out of the Arctic Ocean, along the edges of Greenland, into the Atlantic Ocean. 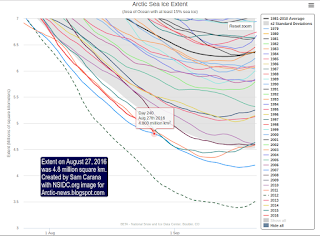 This danger grows as the sea ice gets thinner. Above image shows ice thickness (in m) nowcasts, run on August 30 and valid for August 31, for each year from 2012 to 2016. 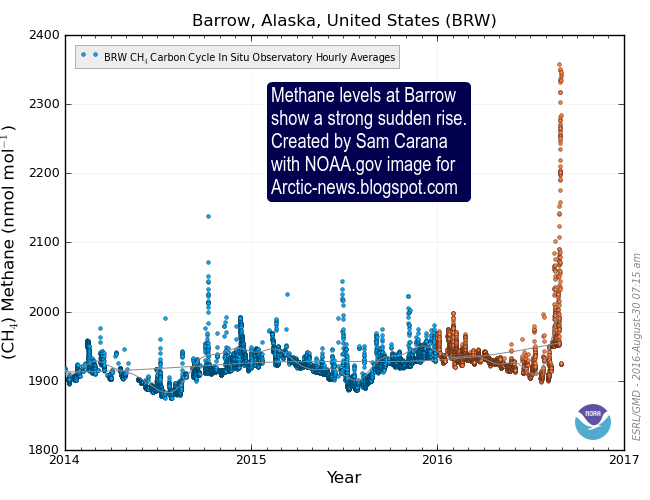 Next to loss of snow and ice cover, another big danger in the Arctic is methane releases. Above image shows methane levels as high as 2454 ppb on August 25, 2016 (top panel), strong releases from Alaska to Greenland on August 26, 2016 (middle panel), and mean methane levels as high as 1862 ppb on August 27, 2016 (bottom panel). 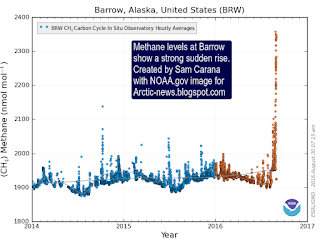 The image on the right shows high methane levels recorded at Barrow, Alaska, up to August 30, 2016. The image below shows cyclonic winds (center left) over the Arctic Ocean on August 22, 2016. The image below shows how little sea ice was left at locations close to the North Pole on August 25, 2016. The image on the right shows that Arctic sea ice extent was 4.8 million square km on August 27, 2016, according to the NSIDC. NOAA data show that the July 2016 global land and ocean temperature was 16.67°C or 62.01°F, the highest temperature for any month on record. The image below on the right shows July sea surface temperature anomalies (compared to the 20th century average) on the Northern Hemisphere. 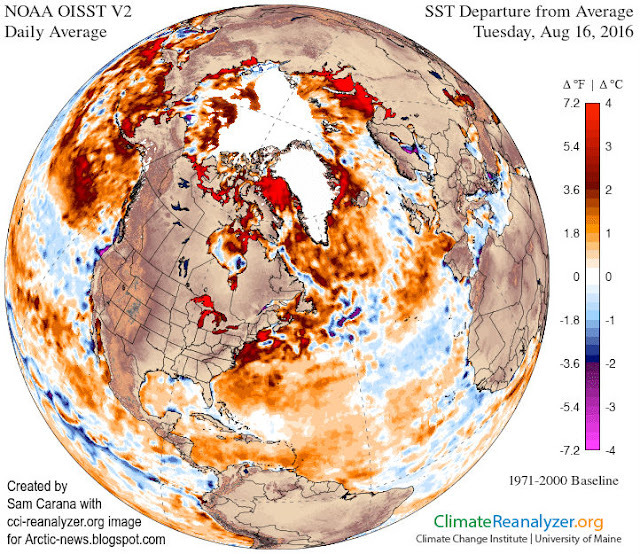 This ocean heat is now being carried by the Gulf Stream toward to Arctic Ocean. Meanwhile, the cold sea surface area that was so pronounced over the North Atlantic in 2015, is getting overwhelmed by ocean heat. This is illustrated by the image below showing sea surface temperature anomalies on August 27, 2015 (left panel) and on August 27, 2016 (right panel). The image below shows sea surface temperature anomalies in the Arctic (latitude 60°N-90°N) compared to 1961-1990. The Climate Reanalyzer image below also shows sea surface temperature anomalies August 16, 2016, this time compared to 1979-2000. As said above, changes to the Jet Stream enable warm air to move more easily into the Arctic Ocean and cold air to move more easily out of the Arctic Ocean. Where seas are shallow, a surface temperature rise can quickly warm up water all the way down to the Arctic ocean seafloor, where it can destabilize methane hydrates contained in sediments. This could make that huge amounts of methane get released from the seafloor. 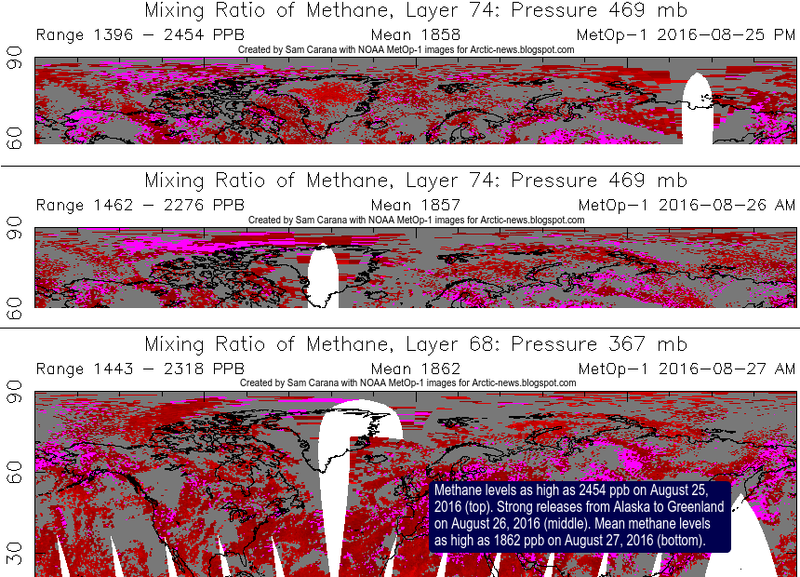 Given that many of the seas in Arctic are very shallow, much of this methane can enter the atmosphere without getting broken down in the water, resulting in huge additional warming, especially over the Arctic. As discussed in an earlier post, this could contribute to a global temperature rise of over 10°C or 18°F by the year 2026. 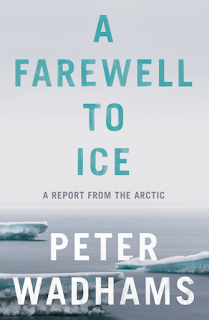 One of the people who has been warning about these dangers for many years is Professor Peter Wadhams, whose new book A Farewell to Ice was recently launched (256 pages, published September 1, 2016). 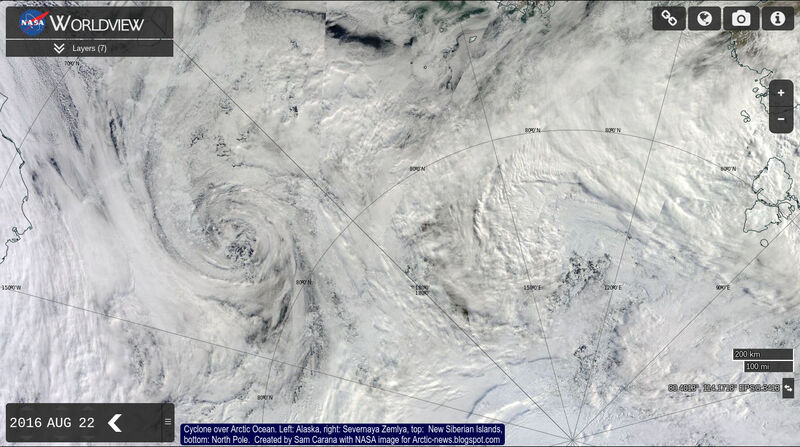 Did cyclones happen in the Arctic before... lets say 2008? I recall hearing stupefied Inu people when they saw their first thunderstorm up there maybe 15 years or so ago. Stopping the fossil fuel industry will require a radical shift of civilizational conciousness. At this point in planetary history, individual humans have very little capacity to change things; the complexity of contextual politics, ideologies, economic interdependancy, ignorance etc. prevents us from making this paradigm shift. Human extinction? Do we still have time? Industrial capacity is still technically short-circuited yet could be aimed at restoring atmospheric loading for Earth to stay garden flying space if alignment with nature's Open Systems is full forced by Act-of-God revaluation of contract law and justice ~Test of Real.